Custom-made colors, surface and gloss levels orders are WELCOME! We are direct importer of solid hardwood flooring, engineered wood flooring, laminate flooring and vinyl slooring. Oak, Maple, Ash, Walnut or Hickory flooring available for sale. We guaranteed the best possible price available on Toronto and Ontario market. Retailers, building contractors, flooring installers, architects and interior designers non only from Toronto and from all over Ontario have come for service and advice not available from other suppliers. 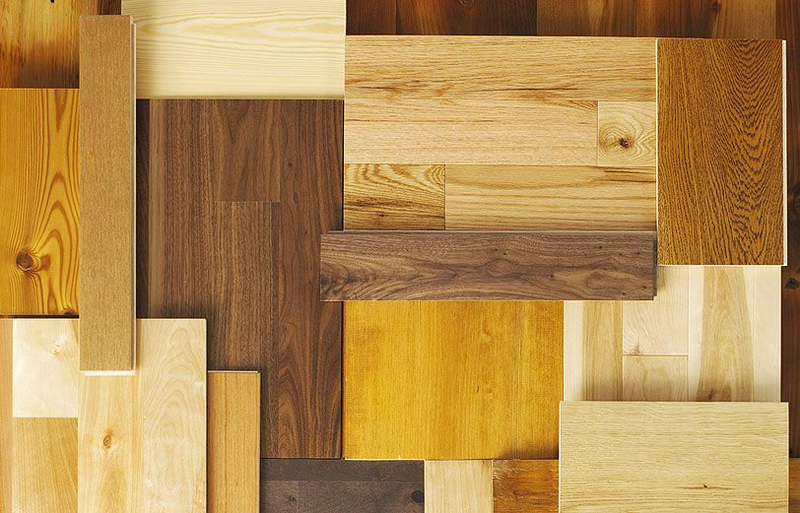 We search all over the world for the best hardwood flooring material and prices to serve homeowners, builders and contractors in order to meet their growing demand. We maintain our own extensive inventory of most popular solid hardwood flooring in smooth, wire-brushed & hand-scraped finish. We also sell solid hardwood flooring as well as engineered wood flooring from most major flooring wholeselers, suppliers and manufacturers. Custom-made orders in any color, any type of finish and gloss level are always welcome. We are small enough to take care of all your residential needs right down to the last detail and large enough. I was very impressed with Canadian Flooring. 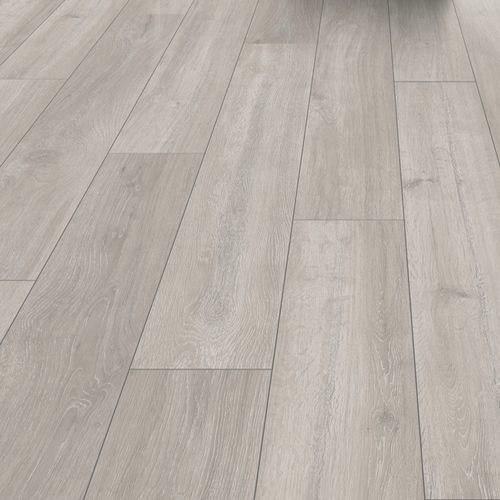 The floor looks beautiful and it was bought at a significantly lower price than at any of the shops I contacted. I would recommend them to anyone! On time, professional and knowledgeable. Delivered as promised. Will use their services in the future as well. Excellent quality, real "Select &Better" grade red oak floors, very fast and friendly delivery. Five-star rated. Very nice and easy to deal with. Perfect job. Recommended. Unfinished Hardwood flooring vs. Prefinished Hardwood flooring. Both unfinished and prefinished hardwood flooring have their benefits, as well as disadvantages that can come with it. To determine what is right for you depends on a factor of thing. Some include how fast you need the job done, if it's a new or existing house, the cost you're willing to spend, and possibly even if you're planning on doing the installation yourself. Prefinished hardwood flooring is a much quicker option. A good choice if you are already living in your home for some time and you are renovating and would like to move your furniture back as soon as possible to the area. You don't need to do any sanding or finishing, as it's already done to the flooring. This means no dust all over the house or harsh chemicals lingering for some time after installation. Installation of prefinished hardwood flooring takes less time, effort and energy, and no time is required for setting. The clean up is also much simpler. Some people prefer the end result of laying down an unfinished hardwood flooring. When you install unfinished hardwood flooring, the finishing is already done separately with each plank. When you lay down unfinished hardwood flooring, you finish the area as whole. The finish seals all boards together, with no spaces between the planks. 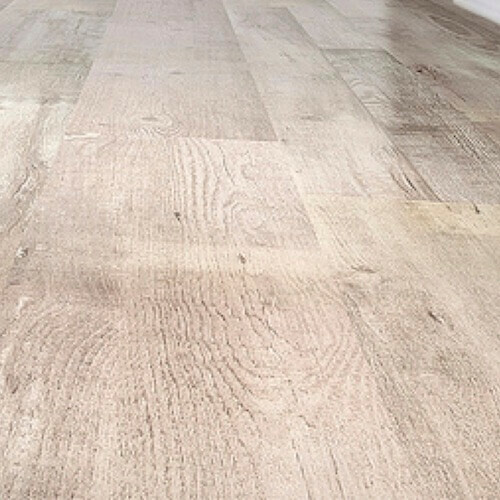 This gives the floor a more uniform look, and can even be better in regards to moisture resistance to hardwood flooring due to the seal of the surface as a whole. A nice advantage to unfinished hardwood flooring is that you can choose the exact colour or stain you'd like your floors to be. However, nowadays there are plenty of options to choose from on prefinished hardwood flooring anyways. Finishing of prefinished hardwood flooring made on factory is much stronger than finishing made by professionals on-site. Standard factory finish is usually done with 10 coats plus one top coat with scratch resistant aluminum oxide finish. This is not comparable to the 2 or 3 coats only that can be done on-site. 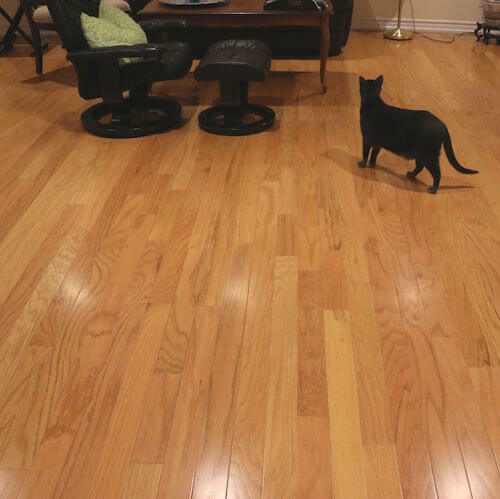 Consider this: if you chose unfinished hardwood flooring and some of the floor gets scratched or dented, it is virtually impossible to do anything about it. Prefinished hardwood flooring is beveled, so there are small spaces between the planks since each plank is finished separately in the factory. If a piece gets scratched or dented, an installer can remove the plank of hardwood flooring and install a new one. Unfinished hardwood flooring is finished all together in the area closing all the small gaps between the planks. You cannot remove a plank from the area, meaning you have to sand and re-finish the area as a whole. Last factor to consider is money, which is almost always an important factor to most people. Prefinished hardwood flooring when you buy the material, all that's left to pay for is installation. Say the hardwood flooring material ranges from $2.99 up to even $8.99, you add around $1.50-$2.50 for installation. If you buy unfinished hardwood flooring it will still cost you around $2.50 up to even $7.99. It's only normally $1.00 less than prefinished flooring. However, instead of simply adding on installation costs, you have to add on finishing of hardwood flooring on site costs as well. Finishing of unfinished hardwood flooring on site ranges from $1.50 to about $2.50 depending on if it's natural finish or stained. It can start to cost you much more to have unfinished hardwood flooring installed. There are endless reasons as to why choosing a wooden floor maybe the best option for any homeowner. To begin with, hardwood flooring is both timeless and natural which creates an inviting and elegant environment to your home interior. Another advantage of is the ease of cleaning the hardwood flooring since it leaves no hiding space for debris like germs and dust. This is a huge advantage for anyone suffering from allergies. 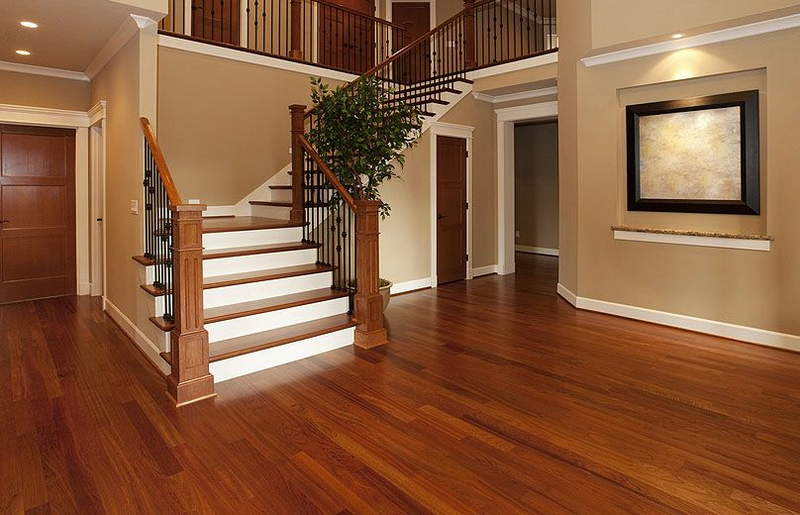 Did you know that a hardwood flooring increases the value of any house? Yes it does! This is all because of its unsurpassed value and beauty. How do I choose the right hardwood floor style for me? A lot of consideration has to be done before choosing right hardwood floor that will best suite you. Affecting the decision is what your subfloor is made of. Mostly the subfloor will determine whether engineered wood or the solid wood would be the right choice for you. A high-traffic house will mostly choose a harder wood because of its resistance to wear and tear. Other factors which will also come in include how you will prefer to finish and the style of your home. What are the type of installation methods? Nail down installation is mostly used to install plank flooring on a wooden subfloor or a ” thick strip of solid wood. The nailing cleats in this case are fastened beneath the subfloor. Gluing and nailing the board is highly recommended when installing flooring planks of 4” and wider. When nailing isn’t an option, glue down may be very appropriate especially when attaching hardwood flooring to a dry and fully cured concrete. This technique involves attaching flooring board to each other without any adherence to their subfloor. The boards are usually attached to each other by an inter-locking system or a bead of glue on their tongue. The main advantage of the floating installation system is the whole hardwood floor moves as a unit which helps reduce cracks between boards. What can damage a wood floor? Using harsh chemicals or abrasives to clean your wooden floor may affect the life span of the floor. Some of these chemicals include ammonia, oil soaps, wax, or vinegar. Wearing high heels on wooden floor will cause denting to your floor. Leaving your furniture legs unprotected can greatly damage the finish to your wooden floor. It’s therefore advised to add protective pads under the legs of your furniture. Excessive exposure to sunlight and its UV rays can also cause your wooden floor to fade or cause color change to in its protective polyurethane finish. To avoid this, it’s recommended to use draperies or shades to help block out the harmful sun rays. How do I care for my new wood floor? If you want your wood floor to last longer, then doing a regular routine cleaning will be a priority. This will involve using a swifter or a microfiber mop to dust the floor, vacuum cleaning every week using a soft-bristled vacuum and at least damp-mopping every month with a recommended hardwood floor cleaner.Depending on your foot traffic, refinish your wooden floor surface every if it has a polyurethane surface at least in every 5 years. You will also need to prevent further floor damage by immediately cleaning up any liquid spillage on your floor. Also adding protective mats and rugs will reduce wear and tear on high-traffic areas. Finally, using protective pads on your furniture will always minimize scratches and scuffs on your wooden floor surface. How do I figure out how much hardwood to purchase? Most flooring is sold by square foot which is the actual measurement of the area to be covered by the floor. Normally, a waste factor of 5% must be added to the total square footage needed for the flooring. The 5% also allows for any defect, if any, in the wood to be cut out. Is it true that there are health benefits of hardwood flooring? Unlike carpets, the hardwood floor doesn’t harbor dust particles, pollen dust, animal fur and other irritants which can trigger respiratory allergies and allergic reactions. Hardwood flooring is therefore recommended for anyone suffering from allergies. On what surfaces can hardwood flooring be installed? Hardwood flooring can be installed on any surface including: ceramic, concrete, wooden sub-floors, vinyl, and marble. However, it’s important to consult with an expert before installation. When do I know it’s time to recoat or refinish my floor? 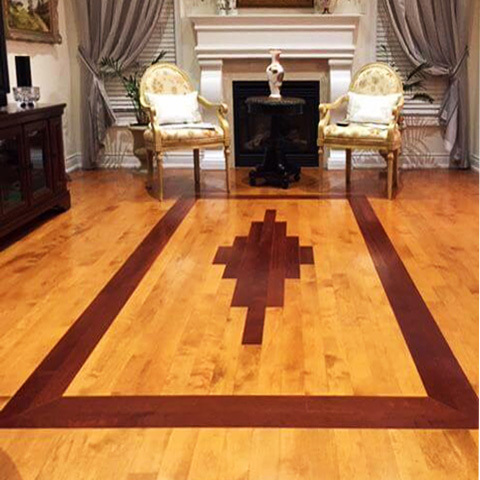 If your hardwood floor surface has significant damage, visible gouge, deep scratches and discoloration, you may consider to sand and refinish your flooring. Why does my floor have cracks on it? It is common for cracks to appear in floors with wider planks due to the shrinkage and expansion over the year. In order to reduce the chances of getting cracks, make an effort to maintain a humidity level of between 45%-55% throughout the year. Dehumidify the humid summer months and humidify during drier seasons helps to keep the humidity level more stable through the year. How can I control contraction and expansion of my floors? Before installing the wooden floor, you can make sure that the hardwood flooring gets properly acclimated to the room before installation for at least 3-4 days. Also the moisture content of the flooring and the subfloor needs also to be checked so as to predict future movement.